Since 1992, Saddle Up for SIRE has raised nearly $1.3 million to meet SIRE’s mission of helping people with special needs through therapeutic horsemanship. Your support of this year’s family friendly benefit trail ride and online fundraiser Oct. 20 at 7IL Ranch in Cat Spring, Texas, underwrites the cost of horse feed, veterinary and hoof care for the horses and keeps tuition fees affordable for riders. There are five ways to give and help us reach our $110,000 fundraising goal. 1…GIVE TODAY: donate or sponsor. 2…BE A SIRE RIDER: raise funds to qualify for personal tuition credits and to be among the Top 24 rider fundraisers who will participate in the trail ride. As of Aug. 30, SIRE’s Top 3 fundraising riders are, Lauren Igler, JP West Wendy Thomson. ** UPDATE: As of September 27 we have raised $34,163 of our $110,000 goal! Top three riders are J.P. West, Wendy Thomson, and Emileigh Marsh. 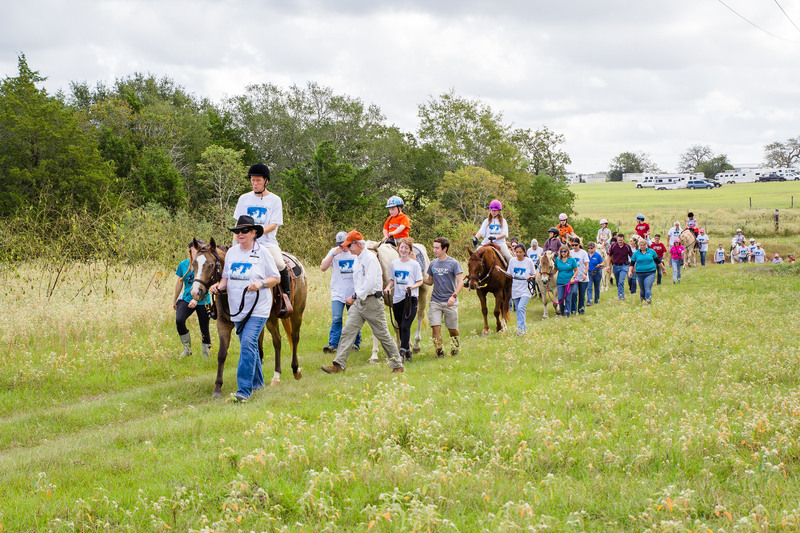 3…BRING YOUR OWN HORSE: register to attend and ride the 40 miles of trails at 7IL Ranch. Registration levels start at $75 (before Oct. 1) for a ticket, t-shirt and barbecue. 4…BE A VIRTUAL RIDER: create an online fundraising page, donate, encourage friends to contribute and receive SIRE swag like a SIRE hoodie, t-shirt and decal. 5…ATTEND: give by registering to attend the day of barbecue, festival activities and friendship. Now celebrating its 26th anniversary, every annual tradition needs memorable surroundings and food. Saddle Up for SIRE will have both thanks to two special partners: historic 7IL Ranch, located about an hour west of Houston, and legendary Rudy’s Bar-B-Q. Riders who bring their own horses to 7IL Ranch experience a 40-mile trail system on gently rolling, sandy loam pastureland with some single-file paths through woods and across shallow creek crossings. Honored with a 150-year Family Land Heritage Award from the State of Texas, the ranch continues as a fifth-generation family business. The name and ranch brand 7IL were created by Lawrence Huber, with “7” calling upon the luck he hoped for as a card-playing gambler and calf roper; “I” remembering Isaac, his grandfather and ranch founder; and “L” standing for Lawrence. Support SIRE, ride on Saturday and camp overnight at 7IL. SIRE thanks 7IL’s Faye and David Reznicek for hosting our ride for the past 18 years. Rudy’s history dates to the 1800s in Leon Springs, Texas, where a one-stop gas station, garage and grocery store added barbeque in 1989, and ultimately became a chain of restaurants known as Rudy’s “Country Store” and Bar-B-Q. Still made today with the original recipes that built Rudy’s Leon Springs’ reputation throughout the Southwest, the Saddle Up menu will include brisket, sausage and turkey fresh from 100 percent oak wood-fired pits. Along with cole slaw, baked beans and potato salad, pit master extraordinaires will serve plenty of their famous “sause” on the side. SIRE is appreciative of Rudy’s ongoing support and generosity.